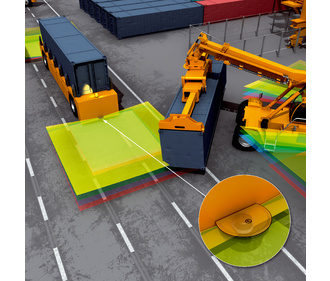 The MRS1000 3D-LiDAR sensor monitors the rear area of automated guided vehicles in three dimensions. In this way, it can detect objects lying on the ground or protruding into the monitoring field. Thanks to its outstanding outdoor performance, the MRS1000 detects objects very reliably. Due to the rotatable plug and the flexible configuration options, there are many options for mounting the sensor. SICK also offers a whole range of accessories, for example a weather hood or mechanical adapters.